Cashew nut belongs to the Family Anacardiaceae together with Mango, Pistachio and Sumac. They have a type of fruit called a drupe (stone fruit). A drupe usually has an outer skin enclosing a fleshy middle that surrounds a single stone or shell. The stone contains the seed or kernel. Cashew nuts are harvested from an evergreen medium sized tree up to 12m. The tree bears a strange fruit with two parts,: an expanded, pear shaped, red to yellow, ‘fruit’ at the stem end, called the cashew apple and at the apex, a single nut surrounded by a green leathery shell. The green nut at the apex is the true fruit. It contains a single bean shaped kernel which is commercially sold as cashew nut. The red or yellow ‘fruit’ at the stem end is a ‘false fruit’ commercially sold as cashew apple. The main producers in order of importance are, Vietnam. Nigeria, India, Brazil, Indonesia, Ivory Coast, Philippines and Tanzania. In East Africa and India, the main commercial product of the cashew tree is the nut. Africa produces more than 6 million tons of cashew apples per year and most are discarded at harvest, because the taste is not popular with the locals. They’re left on the ground for animals to eat, Monkeys love them. In South America and West Africa, the locals regard the cashew apple as a delicacy. As mentioned above, the cashew nut is surrounded by a green leathery shell. The shell has an inner and outer wall. The two walls enclose sponge like interior infused with a thick toxic liquid called Cashew Nut Shell Liquid (CNSL) or Cashew Shell Oil. The composition of the liquid varies depending on how it is processed, but it’s strongly irritant to the skin. Inside the toxic shell is a large curved, kidney shaped seed, nearly 3cm (1.2 inch) long which is the edible cashew nut. The seed is surrounded by a thin reddish brown seed coat (testa) which protects it from the toxic liquid. The kernel remaining after removal of testa is the cashew nut of commerce. The shell does not split open and therefore the cashew nut is very difficult to extract. The green unshelled nuts are first washed to remove visible debris and then soaked in water to increase moisture content and avoid scorching during the next stage, roasting stage. The soaked unshelled nuts are roasted in special roasting equipment. The oil is released and collected during roasting. The green leathery shell becomes brittle and easier to crack. In India, shelling or cracking open of the shell is done manually. A nut is placed on a flat stone and cracked with a wooden mallet. Gloves are required because the residue from the toxic liquid is irritating to the skin. One worker can crack 5kg nuts in an 8 hour working day. The nuts can also be shelled using a semi-mechanized shelling system. The shelled kernel is still covered with the seed coat (testa) and to facilitate removal of the testa, the kernel is dried. This reduces the moisture content from 6% to about 3%. The low moisture content also protects the kernel from pest and fungus attack at this vulnerable stage. The seed coat or testa surrounding the kernel is removed manually by rubbing gently with fingers. One worker can peel 10-12kg kernels per 8 hour working day. The testa can also be removed using mechanized peeling methods like air blasting, suction, freezing or use of rubber rollers. Breakage is about 30%. All grading is mainly done by hand or mechanical methods like power driven rotary. After grading, the moisture content is increased to 5% to make the nuts less fragile and reduce the risk of breakage, during transport. Packing is done in airtight containers. 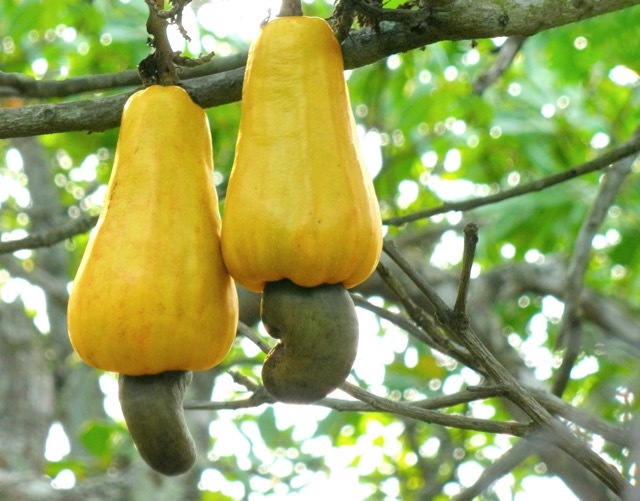 Want to Read More About Cashew Nuts? Next What is the difference between baking powder and baking soda? Do you know that we call cashew as “monkey nut” in Indonesian language? I have been not so active with my PC due to limited internet access. I hope you have a Fantastic Friday and a Wonderful weekend! It’s great to hear from you again. At least you’ve learnt how to use WordPress on a smart phone. I would never ever manage to do that. Have a wonderful weekend too. And please keep in touch. Well – ‘who knew’!!?? I would have NEVER pictured my beloved cashews coming from such a strange-looking ‘yellow thingie’ with a ‘green thingie’ hanging off the bottom?? Fascinating!! Question – can the part called the ‘apple’ be eaten as well? I have a feeling not… And who would’ve ever have thought that the cashew nut is surrounded by a toxic liquid – but that makes so much sense. No animal would ever take a second little bite, that’s for sure!! (And I don’t mean to be a know-it-all but I believe the apex of something is at the very top …) + I’m out of cashews and this post has reminded me to buy some more – they’re sooo good!! Happy New Year Cecile. I’m so happy to see you after such a long spell of silence. The apple part is eaten. In Brazil the It’s used to manufacture jams and soft alcoholic drinks. In India it’s used to distill cashew liqueur. It can also be used to make jam.The only big problem is, it spoils within a day if kept at normal temperature. It must be refrigerated. Yes the apex means the tip. I need to buy some cashews too. Have a lovely week and the best of 2016! Hi Liz – its so nice to be in touch again! You have become quite the cashew expert my friend – its so interesting!! Happy New Year to You!! I’ve really missed our little chats. Glad to see you again. Have a wonderful day! I didn’t know any of that information about cashews. I’m not a particular fan of them but I do know they are expensive to purchase. When I go to Australia, I will be looking for a particular dip that has Cashews mixed with some sort of pesto sauce. I tried to copy it when I got back from my last trip, alas it didn’t turn out very good. I wonder if I can bring some home with me….must check that out. Not sure what’s allowed these days. So, thanks Liz for posting this and aren’t they a funny looking product when they are growing? Cheers Liz, missed this post somehow. Happy New Year Sandy. I hope you had a great Christmas and a lovely beginning to 2016. This year I just decided to have a quite evening on the 31st for a change. It was quite nice. I love, love, love, cashew nuts except they are so expensive. I still buy then anyway for snacking. I used to love them fried or roasted but I started eating them raw some weeks ago and now I kind of like that raw refreshing taste. I think you can bring processed food. That sounds like a delicious dip. I make my pesto from cashew sometimes and it tastes really nice. I use them interchangeably with almonds. I have also started eating raw almonds. I think in the next five years or so I shall become a vegetarian of some sort, ha ha! I love meat…Have a great week Sandy and thanks so much for visiting the blog. Thank you for this post! Now I know why cashews are expensive due to the labour intensive process! I’ll appreciate them a lot more! Thank you very much,and happy new year! Thank you, Miss Dinie! Have a wonderful week! I’m trying, looking forward to my birthday soon! Omg when is your Birthday? I am so excited to hear that!!! I must remember to send you birthday wishes. Have a nice day. That’s nice of you.. Thank you! The boys love cashews, of course they do. They like expensive foods! Ha ha I like expensive foods too, but I cannot afford them!!! Perhaps the monkeys were already eating them then man said “aha this can be edible”. I think during stone-age it was a matter of trial and error. Sometimes it worked, other times not. Have a lovely weekend! Great post. . . I enjoyed learning about cashew nuts. Thank you for reading. Enjoy the weekend. Ours here is a little bit snowy but nice. Jeez–I had NO idea! I will appreciate cashews much more now! Sheesh. No wonder they’re so expensive. Oh yes lots of work isn’t it? Have a great weekend! Now I know why cashews are so expensive! That’s a lot of work for one little bite. Too much work, but cashew nut is a great favourite of mine. I love eating them! Good to know. I’m just eating cashews right now and binge watching Star Wars 1-6….before the new one comes. Have a lovely weekend!